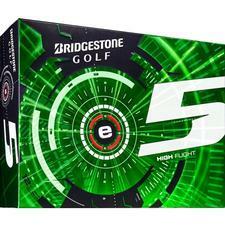 Bridgestone Golf e5 Golf Balls - 1 Dozen - White - 26.99 - GolfersEdgeOnline.com - Best Golf Equipment On The Web! The new Brigestone e5 golf ball is a 2-piece construction designed for more lift and longer carry distance. Bridgestone e5 balls feature the New WEB Dimple design technology for enhanced distance and flight performance. If you have any more questions about the Bridgestone Golf e5 Golf Balls - 1 Dozen - White; do not see the model you are looking for; need custom options; or prefer to not purchase online, then please call us at (630) 656-1291.